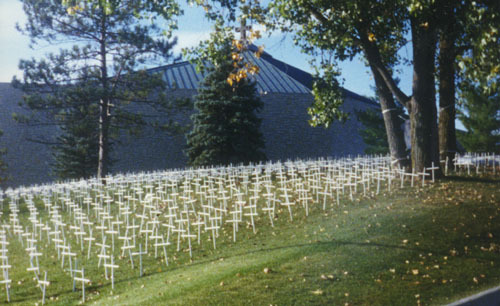 The National Day of Remembrance (AbortionMemorials.com) is an effort of prayer and education focused on the approximately thirty locations throughout the United States in which the bodies of children killed by abortion are buried. By telling the stories of these burials and having memorial services at each of these sites, the public is brought to a deeper awareness of the humanity of the unborn and the inhumanity of abortion. Moreover, this occasion can lead those who have lost children to abortion to a greater measure of healing. This initiative is sponsored by three national pro-life groups, Priests for Life, Pro-life Action League, and Citizens for a Pro-life Society. The National Day of Remembrance is scheduled for Saturday, September 14, 2013, which is the 25th anniversary of one of the major burial services for these children in Milwaukee. On that day, simultaneous memorial services will be held at these gravesites, led by local clergy and pro-life citizens. Local communities will publish the stories about how these gravesites came to be, and will invite people to visit them on an ongoing basis. We intend to make this an annual observance. Some of these graves contain hundreds and even thousands of babies in one burial plot. Most of the time, the bodies were discovered in trash dumpsters outside of legal abortion clinics. In one case, in the early ’80’s, workers discovered a large container with the bodies of 16,500 aborted babies in it. Pro-life citizens wanted to do what every civilized society does, namely, bury them. But because of the opposition of abortion supporters, that did not happen until after a three-year legal battle. Abortion advocates try to avoid what will reinforce the humanity of unborn children. That’s part of the power of this project. Many of the children in these burial sites were killed in the later stages of pregnancy. At the present time in the history of the battle over abortion in America, in the light of the trial and conviction of Kermit Gosnell and the passage by the US House of Representatives, and various states, of the Pain-Capable Unborn Child Protection Act, the reality of late-term abortion has been brought into clearer focus for the American public. Awareness of that reality leads to a logical question: what is done with the bodies? The National Day of Remembrance builds on that question and strengthens that awareness, creating a focal point for our grief, both national and personal, and for the education of future generations. Not only will these services raise awareness about abortion, but they will also provide opportunities for an urgent call to healing after abortion. The work of Rachel’s Vineyard and the Silent No More Awareness Campaign, the world’s largest ministries for healing after abortion, and which both operate under the auspices of Priests for Life, have taught us that the opportunity to grieve at a gravesite, or have a memorial service, is an important step in the healing process. This Day of Remembrance will bring a great deal of healing to many people, and kindle in them new hope. Volunteers are still needed to make these September 14 events a success! Visit AbortionMemorials.com to sign up!